The U.K. must adapt to the new compliance burdens and Brexit complexities to maintain its allure. London, 17 April 2018 – The U.K. is one of the most celebrated, sophisticated, and prosperous wealth hubs globally. It has been a magnet for wealth managers and wealthy investors for centuries, with London being not only a European wealth hub but also a global one. 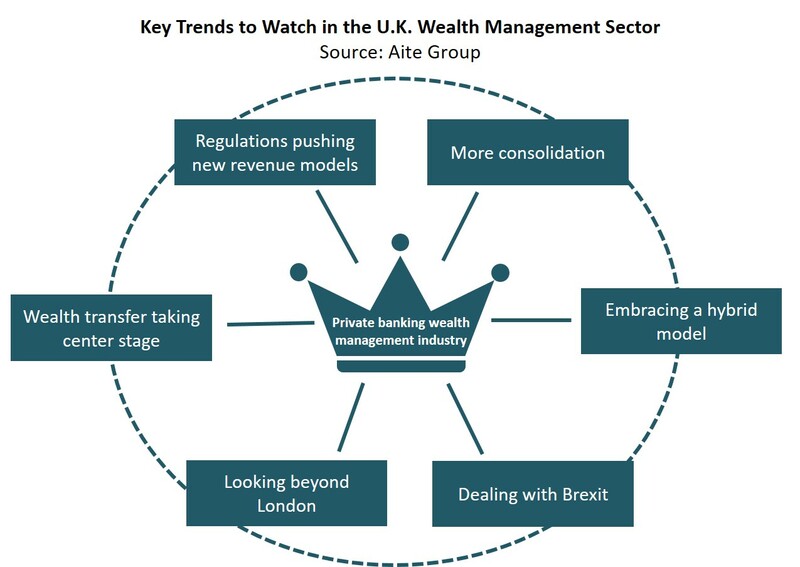 The U.K.’s wealth management market is highly competitive and is unlike any other, as it has its unique dynamics that players need to understand and work with. However, uncertainties have been whirling around the U.K.’s continued appeal as a globally competitive and lucrative wealth management market post-Brexit. Will the country be able to retain its glory, or will the opportunities for local and global industry participants be reduced? This Impact Report demystifies some of those uncertainties by providing a comprehensive analysis of the current wealth management market. It is based principally on primary in-market research calls and interviews with different types of U.K. wealth management practitioners between November 2017 and February 2018, supplemented by desk-based secondary research. This 56-page Impact Report contains 14 figures and 14 tables. Clients of Aite Group’s Wealth Management service can download this report, the corresponding charts, and the Executive Impact Deck. This report mentions Aberdeen Asset Management, Adam & Company, Ahli United Bank, AJ Bell, Alder Investment Management, Allied Irish Bank, Alta Advisers, Arbuthnot Latham, Aviva, Bank of America, Bank of China, Bank of Ireland, Barclays, Berenberg Asset Management, BlackRock, BNP Paribas Wealth Management, BNY Mellon Wealth Management, Brewin Dolphin, Brooks Macdonald, Brown Shipley, C. Hoare & Co, Cater Allen Private Bank, Cayzer Trust, Cazenove Capital, Charles Stanley, Citi Private Bank, Coutts, Credit Suisse, Citizens Financial Bank, Danske, DBS Bank, Deutsche Bank Wealth Management, DOS & Co., Emirates NBD, Europe Arab Bank, Falcon Private Bank, Fidelity International, Franklin Templeton, Goldman Sachs, Guardian Wealth Management, Hargreaves Lansdowne, Hampden & Co., HSBC, ING, Investec Wealth & Investments, James Hambro & Partners, Jefferies Wealth Management, JM Finn, Julius Baer, J.P. Morgan Private Bank, J. Safra Sarasin, KBL European Private Bankers, Klienwort Hambros, Kilik & Co, LGT Group, Lloyds Bank, Lombard Odier, London & Capital, Metro Bank, Meyado Private Wealth Management, Moneyfarm, Moola, Morgan Stanley, Munnypot, Nationwide, NatWest, Nomura Holdings, Northern Trust Wealth Management, Nutmeg, Old Mutual Wealth, Permira, Pictet & Cie, Psigma Investment Management, Qatar National Bank, Quilter Cheviot, Rathbones Brothers, Royal Bank of Canada, Royal Bank of Scotland, Close Brothers, Sandaire, Santander, Scalable Capital, Schroders, Seven Investment Management, SigFig, Smith & Williamson, Société Générale Private Banking, Speirs & Jeffrey, Standard Bank, Standard Chartered, Standard Life, Stanhope Capital, St. James’s Place, Stonehage Fleming, Tilney Group, Towry, UBS, Union Bancaire Privée, Vestra Wealth, Wealthify, WealthSimple, Wealth Horizon, Wealth Wizards, WH Ireland, Wells Fargo, and Weatherbys.